The design company I work at have recently moved studio which not only brings me a nice big, gleaming white desk, it also brings new lunchtime venues that I'm looking forward to exploring! 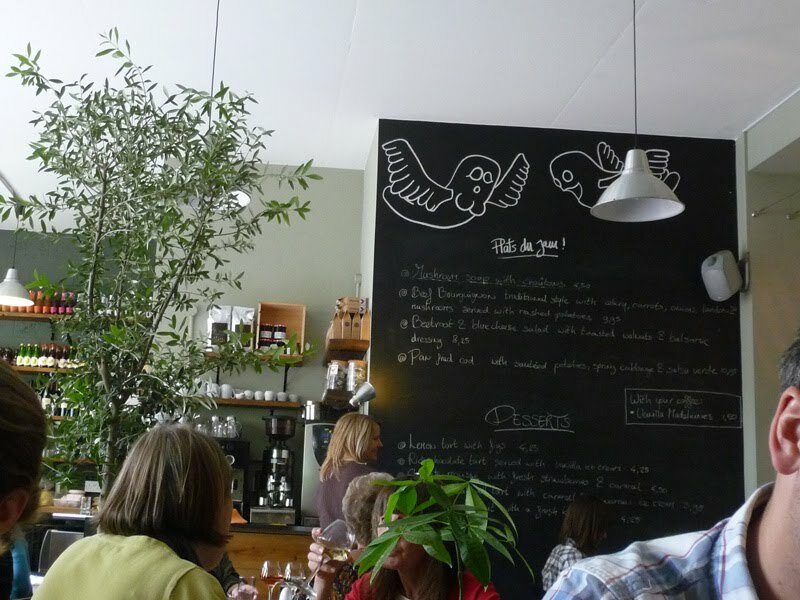 First on the list is Mange Tout, a very cool French cafe with a lovely interior. The friendly French owners have been very keen on details and it has been designed beautifully. 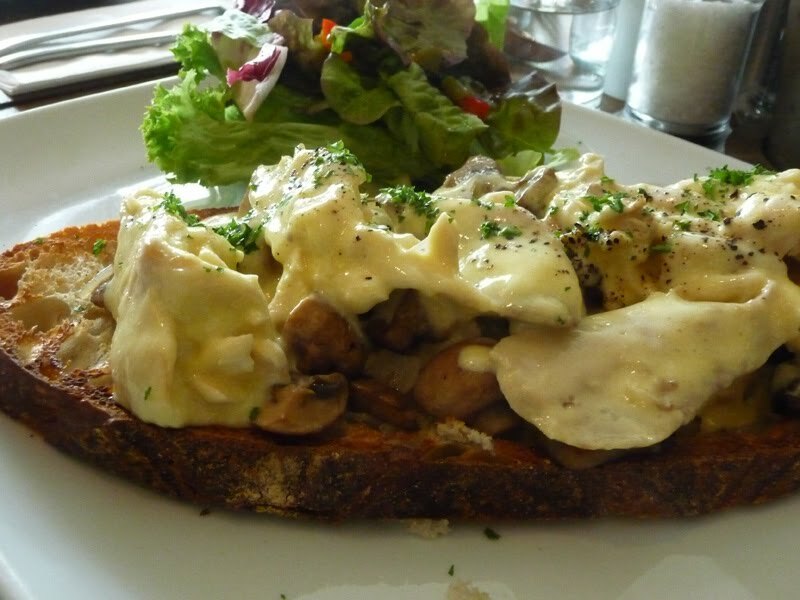 The menu is difficult to choose from only because everything calls to you; steak frites, moules, tartines, chacuterie platters, a whole section on eggs; omelettes, poached... and a plats du jour board with hearty beef bourguignon or lighter salads. They also have a nice drinks menu with organic fruit juices and pretty coffees. However service, unfortunately, was sloooooooow. 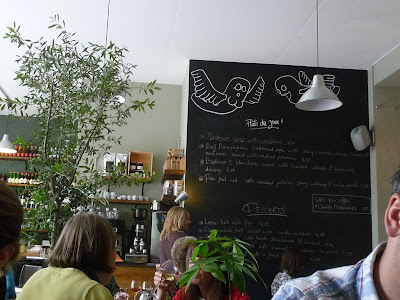 We waited an agonising 40 minutes for our food, so with the average hour-long lunch break in mind, it doesn't give you long to er, mange tout. Which was a particular shame as my practically raw steak tartine (£9.95) was the chewiest piece of meat I have had in a long time. I would have needed a generous hour to chop through this and about three months to digest. As the steak was more suited to feeding time at the zoo, I picked it off and left it sadly uneaten. 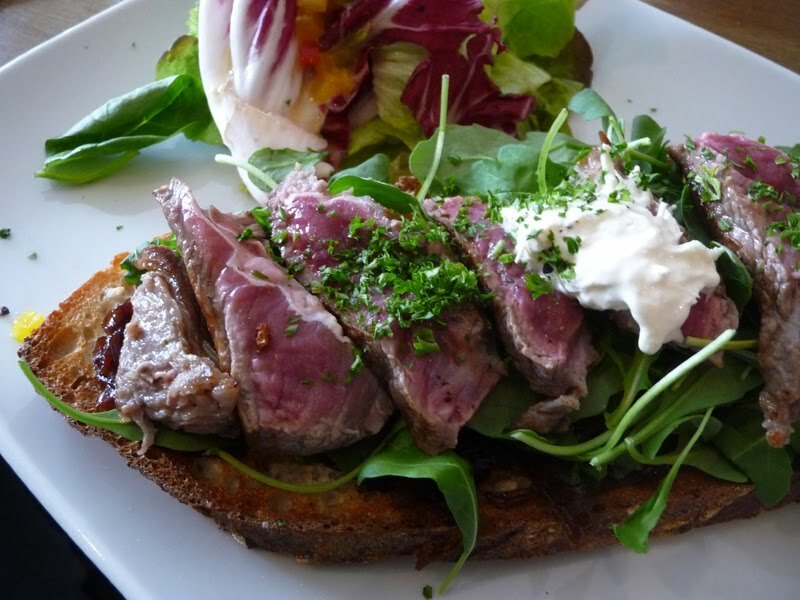 The caramelised onions and the horseradish sauce were very tasty and had the meat been any good, then it would have made for a winning sandwich. The sourdough open tartines were a popular choice on our table and to be fair, the other ones looked much better than mine. 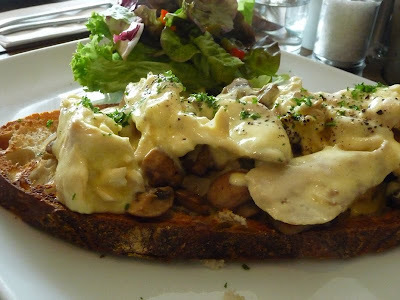 The Forestiére tartine was a chicken in a cream open sandwich with a wine and shallot sauce and sauteed mushrooms. The omelette got a thumbs up and the salad was devoured. 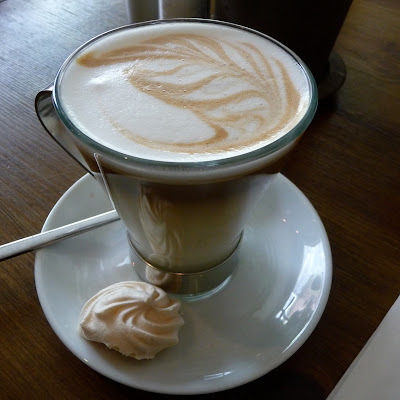 The table opposite us ordered eggs Benedict, with lots of glossy hollandaise which I feel the need to return for, possibly at the weekend when I have more time.